Here they are! Your best characters from Adventure Time! Yeah! These are Finn and Jake and they are going to explore this amazing places and just do everything to avoid all the obstacles here. So, if you are ready for that, then start the game right now! Wow! It's incredible! 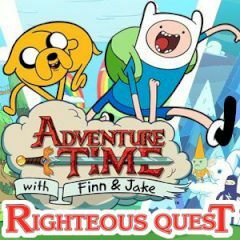 Cause this time you are going to guide Finn and Jake on their quest to become the most righteous of all heroes. Do not forget to collect all five bonuses in each level to unlock the bonus. And, of course, refills Jake's special ability. By the way, you can use Jake's special abilities when near a sign. Just stretch over obstacles, sail over hazards, press Z to smash all enemies on screen and you will really love this amazing game. So, just have faith in yourself and take part in such a cool adventures.